All things being equal, a dollar of recurring-cost savings has more impact than a dollar of earnings. This is because recurring-cost savings can cut money out of your baseline spend forever, while no income can be guaranteed over the long haul. Traditional income from a paycheck must be earned and re-earned, and can change dramatically over time via a job loss or change in pay. If you're in sales, commissions are variable -- even long term customers may leave you without warning. Even truly passive income (e.g. - dividends) can't be counted on long term, or at least not with complete certainty. On the other hand, cutting out a recurring cost can save you money forever. When you cancel your cable bill, you've booked the impact of those savings for each and every month until you die (presuming you don't sign up for cable again). When you sell your second car in favor of riding a bike more often, you cut out gas, maintenance, and insurance expenses from your budget this year, and every year going forward. Saving money is not particularly time intensive either, at least compared to what one typically would do to earn more income (a side hustle, second job, overtime at work, etc.). Some savings methods are time intensive too, of course: clipping coupons takes a while, and is a good way to get carpal tunnel. But a single call to your cell phone provider, and switching to an MVNO, can cut out ten or twenty grand of expenses in just a few minutes. Even one-time savings are more quickly achieved than one-off income. If I want to mow a neighbor's lawn for twenty bucks, finding one customer and mowing just one lawn takes a decent amount of time and effort. While all I have to do to prevent myself from buying a new riding lawnmower is to stay in my house, and not drive to Sears. Not buying things is easy, and takes no time at all: just don't go to the store. The sneakier reason that a dollar of savings has a greater impact than a dollar of earnings is due to taxation. A dollar of income is usually subject to a number of taxes: federal and state income taxes, SSI, Medicaid, and, by the time you're done with what's left of that dollar, probably some sales tax, too. Even when ignoring the better long term impact of expense reductions, you need a lot more than a dollar (let's say at least an extra quarter) to have the net impact of a dollar saved. Of course, there's a limit to achievable savings. You only have so many costs that you can, or would want to, cut out of your budget. And, yes, even though you will eventually be punitively taxed if you keep increasing your taxable income, there is no limit to the income you can earn. Still, I think it's prudent to first spend your time and effort on reducing expenses, because you'll get a greater impact, and you'll do so more quickly. It's more efficient to first spend your energy approaching your ideal level of spending, than it is trying to increase your income. Once you've cut down your budget to the right level, sure, spend some time and effort making more money if you want. Though if you cut out enough from your budget, my guess is that you'll find you already make enough, and would rather just keep your precious free time to yourself. *Photo is from bradipo at Flickr Creative Commons. Great points. I definitely have to agree with your conclusions...and one big reason is because I work in government. It's pretty hard to increase my salary...it's really just based on a salary schedule and you move up based mostly on seniority. Sure I can get into side hustles, which I've wanted to do...but yes it can be time consuming. It would cut into time I could be spending with my wife and baby. On the other hand, canceling cable or calling up to ask for a discount, or getting rid of a reoccurring expense saves me money easily. I cut my teeth in government work, too, with the same sort of set salary increases. Whether I worked hard or not, it was basically the same union- negotiated raise (on the years I got a raise). Still, while income isn't always in our control, a lot of our expenses are. And yeah, with your new and larger family, I think that time is much better spent with the people you love. I am soooo with you on this one. I was able to retire from employment at age 39 and cutting expenses was a HUGE part of my equation. I'm probably a bit more extreme in that department than most are, but for me, my time and freedom are just so much more valuable than a few extra dollars to spend. I remember one time as I was nearing my escape from employment I was chatting with a fellow at work. He was working at our front desk while he was between careers, and I was telling him about my passive income schemes and escape plan. I made some remark about how if I could get my passive income to a reliable $20K annually, I'd feel pretty happy. He said, "Yeah, and extra $20K annually would make life a lot easier." I responded that I meant I would feel safe retiring once I had that kind of passive income. His response was "Oh NO! You do NOT want to try to live on $20K annually!" I didn't have the heart to tell him, but at the time I was already living on much less than that and socking away the difference in savings and investments. Obviously we should focus on both cutting expenses and increasing income. But for those just starting out I think it's important to focus on cutting expenses to where you're comfortable with it. Eventually you get to a point where you then have your expenses essentially set. Once the expense side is taken care of then focus on finding ways to increase your income whether that's a side hustle or a new job altogether. The taxation point is one that I always try and remind people of when they bring up this issue of expenses vs income. A dollar cut from your expenses is really about $1.25 of needed income to have the same net effect. I wish I'd phrased it the way you had, Passive Income Pursuit. That's succinct and clear. Dealing with expenses first, and learning to live well within your means, really gives you the skills to put your existing income to work. After that, any additional income can really have maximum impact since you know you won't spend so much of it. Agree with you DB40 that the focus on expenses is often the most effective way to make a big impact on your financial health, particularly when you take the precious commodity of time into account. The other great benefit of focusing on expenses is that it really makes you focus on your core values and the things that are important to you - usually you find the expenses you cut are things you really didn't need to be happy, if you go about it in a thoughtful way. If you start earning more money instead, you might not be as inclined to think about where that extra money goes, without having focused on your expenses first. That's a great insight, Jason. The first and easiest things to cut out of our spending are often things that don't improve our lives anyway. And without first controlling expenses, I've found that additional income doesn't have much of a positive impact. The beauty of it is it's not black or white, so we don't have to choose! Yay! I'd say if you want to feel immediate impact then cutting your costs is step one. After that, you can begin to try and earn more. While it may or may not be variable, whereas you can only save to much cutting certain things, earning is unlimited. That's true, Tonya. And I think that's definitely the benefit of focusing on income: there's really no limit to what you can potentially earn. Like you said, it's not black and white and there's no need to choose between either good option. I just think it makes for a more interesting post to take a side. Couldn't agree more. Cutting expenses isn't only more efficient than earning more income (assuming the same dollar amount), but it also gets you used to frugality, which should make it easier to become financially independent on much less income. So once you cut the expenses, you'll be able to live on much less income even if you're not able to increase that side of the ledger. Creates a much easier path to FI, in my opinion. Thanks, Jason! The benefits of frugality has an almost immeasurable ROI. Living on less means you need less of a nest egg for financial independence, that your current income can provide a higher savings rate, and you avoid the pitfalls of consumerism. There are many paths to FI, but like you said, I think frugality is by far the easiest. It might also be the quickest. B.S. Cutting expenses instead of making more income is limited thinking. I'm not advocating you spend yourself silly but, by focusing on expanding instead of contracting, you align yourself with universal laws. And saying you can't earn more at your job is B.S. I know a lifetime teacher/school admin. who got her PhD because that's what people in the education field are supposed to do, but now she's getting paid speaking and consulting gigs on the side of her government job! Ha! What a comment. I appreciate the candid take, Leah Little. As you probably gathered from the first paragraph of the post, I can appreciate that the issue of earning vs. saving is a little more nuanced than a simple "either/or". Of course, I agree that it's a good thing to earn more income. I just think it's better to focus on controlling expenses first. I don't believe anyone said "you can't earn more at your job". Of course you can -- so we can agree on that. As for your example of someone getting a PhD and earning more income, good for her, but that's a pretty time intensive path to earning side income. Earning a PhD takes many grueling years, doesn't leave much room for anything in one's life besides the program during that stretch, and frankly is a bit of a gamble if you're hoping for the big pay day at the end of all those years. As I stated in my post, I think you have to carefully consider whether you want to trade all that time for (hopefully) more money, when there are other ways to skin that cat. It seems like the plan paid off for her though. As always, personal finance is personal. We cut our living expenses to a fairly frugal, but comfortable level back in 2005...and since then have done everything we can to keep it that way. I think a low core budget is the building block to everything else. You can strive to earn more after that, but FF starts with your basic living expenses. I wish I'd put it that succinctly, Laura. Frugal living is the foundation. Definitely with you on this. I would also add in the dimension of time. I think learning how to spend less comes first, as it is more powerful. And then, when you run out of ways to save, then you focus on earning more. If you do it the other way around, you won't be able to avoid lifestyle inflation. Time is probably the biggest factor. We have so little of it, so spending more of our precious time to earn money is always a gamble. Like you noted, unless you already have the foundation of frugality, that extra income is likely to go towards additional spending. Thanks, Laurie! You guys are frugal ninjas -- we have a lot of areas we could still save in. I've worked at increasing salary (12.5% and then 1.5% COL on top of that this year) so even though I'm only taking home about 70% of that increase, it's still substantial. Add in with some scrimping, and I feel like I'm getting somewhere! I'm good with doing both for sure, but I do appreciate at some point (especially with diminished returns on time worked) that cutting expenses gives a better bang for your buck ($0.70). Both is definitely the right approach, Alicia, even though I took a stronger stance in the article. I figure as long as your costs are under control, there's a lot of upside in getting more income coming in each month. Start with the cuts and move on to the income, talking from experience on this one. Cut until you can't then move over to the income side. That's the approach we took too, Steven. Now we're able to really put our extra income to work! Love this! We're coming at FI from both angles--increasing incomes and reducing expenses, but, strange as it may sound, we derive more joy from cutting expenses. As you wisely point out, we can rely on these lower expenses for the rest of our lives whereas we plan to drop the incomes. I also agree that living at one's frugalist (new word!) helps illuminate what you really want out of life. Instead of being trapped by the need to buy what you think you "should" or doing what you're "supposed" to, you can live your truest existence. Great post! I love "frugalist", Mrs. Frugalwoods. You might be on to a book title with that one. Great minds, brother! Just started thinking about these lines myself after reading an article from MMM. And blogged about it the other day too! Happy 4th to you and the fam. Thanks, J Money! I must have missed that post, but I've fallen behind a good bit with my blog reading. I have tomorrow to catch up! Cutting expenses "seems" harder than earning more sometimes though. We're getting ready to spend a lot to cut our expenses, it just took a move to do it! That's a point I did miss: cutting things out of your budget really does seem hard. It usually involves some serious behavior change, and we're naturally inclined to resist that. I'm excited you guys are moving and can't wait to see some beautiful photos of your new digs! I felt the same way Laurie did. I've always found it much easier to cut expenses than to earn more, so that's largely what I've focused on the last year or so. There does come a point where one is content with how much has been saved, and I believe that's when earning more can kick in. Definitely agree with focusing on expenses first, for all the great reasons others have expressed. Great take on it. Thanks, EM! I agree with your take, and we're in the 'earn more' phase of the game now that we're fairly happy with our savings rate. We could certainly cut more, but would be venturing into cheap' rather than frugal territory. That's some great info, Coin Comments. I had no idea that quote wasn't accurate. I thought I was making a clever point, and Ben Franklin beat me to the punch by over 200 years. What a jerk! God I love your writing. The evidence of it's greatness is in the comments it sparks. I think there's a lot of grey, but mostly agree that cutting spending is more powerful. And it's not so much in cutting one bill, but adjusting your habits. You can make all the money in the world, but if you don't live with and stick to a reasonable budget you'll find that you're not amassing any wealth. On the flip side, just to play an unnecessary devil's advocate, if you've cut all you can, living ghetto fabulous, and still can't make ends meet, you may have to sacrifice that time to improve income. The good news is that there are programs to help people in the most dire of situations do just that, providing most of the resources they will need...aside from time. But for most of those vocal invl the PF blogosphere, that's not the situation. And simply reigning in spending can do wonders. *in. I don't know what invl is. Sorry. That's such a nice comment to hear, Femme Frugality. I need to copy all these down and read them whenever I'm feeling blue. I've got a ton of it lol. Some of it is controversial because it involves welfare programs, but that's what they're there for is the people who want to work hard and get into a better situation. For college, if you're at that level of income the fafsa does A LOT. And if you can write a good essay or can get help doing so, scholarships can easily cover the rest and then some. If you need childcare to do so, there are government programs that can cover that, too, even for five star day cares or nannies. No risk...you can even make money by going back to school. And all those compliments are well deserved. Your writing is amazing. I think it's a balance. The thing about frugality is that there's a finite limit to it, whereas there is theoretically an infinite earning potential. I think finding a level of spending/frugality at which you feel comfortable and wouldn't mind sustaining (what's the point of cutting past your point of enjoyment if you're then forced to maintain it for the rest of your life?) and simultaneously working on increasing income is the easiest balance that we've found. People might think they can't increase income, but I think a lot of people don't realize that a significantly larger portion of people spend part of their working lives in the upper income brackets (12% will spend at least 1 year in top 1%, 29% in the top 5%, and 73% in the top 20%*). It's kindof amazing to think of how mobile our society is at least on a short term (1 year) basis. So as long as you maintain your basic but not extreme frugalness, you catch the upsides of these income swings and bank them. That's what we're doing. Those are interesting statistics, Mrs. Pop. It's hard to reconcile some of that with the data we have about economic mobility, or the lack thereof, in the US. It's hard to know which narrative is true, you know? Intelligently written, Mr. DbF! I tend to fall in the save more/reduce expenses camp, mostly because I own that I'm a creature of leisure (read: lazy) when it comes to exploring side hustles. :) This being said, I do like to maximize my earnings when I am working, so I do find myself reassessing my career path fairly often (as well as networking) to make sure I'm not being stagnant/ working my way up to more lucrative positions. I hope you have a Happy 4th! Thanks, Anna! The 'both' approach is definitely the way to go, if you can do it and are comfortable with the extra hustling usually involved in increasing income. "Yes, of course, the right answer is "both," but that's boring." Haha! Of course, I was going to say "both", but then I saw that :) I agree though, ultimately decreasing your expenses saves you not only in that moment, but in all moments to come. Yeah, "both" is boring. Better to take a stand, you know? I like the concept of reducing expenses, and I always think of the mindset behind when people say to earn more instead. My first reaction is to cut expenses, then move on to earning more. I guess it all depends what's easier or ingrained in every person, as we are all different in how we handle money. True, it's kind of a personal decision, regardless. And whatever you're currently earning (or what your budget's currently like) plays into that, too. True that cutting out a recurring cost eliminates that cost immediately and forever but that's only half of the equation. You must also find a source of income from rentals, dividends, etc. that can sustain you till your last breath. I feel that having a dividend portfolio can be as close to a guaranteed income as anything else. Hold 30 - 50 stocks and if 2 or 3 fail or more you'll still be generating an income. Nothing is guaranteed long or short term. all we can do is cut and build a varied income stream. Thanks for sharing. Interesting discussion, and I completely agree that if we take a literal perspective, a dollar saved certainly has a higher monetary value than a dollar earned. However, I believe our mindset creates our behavior. Our behavior creates our habits, and our habits determine our personal financial path. Fundamentally, I agree with the prior comment about an abundance mentality vs. scarcity mentality. If we are arguing on behalf of saving money vs. making money, then the answer must be making money. If we have an abundance mindset when it comes to money...i.e. if we believe we can always make more money, that there is enough money available to achieve what we desire, then we will prime our minds for making more money. 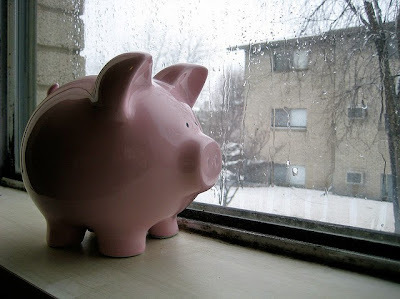 If we believe money is scarce, that rainy days are surely ahead, then we will likely have more rainy days. Just my two cents!!! Compelling post, thank you. This was my ah-ha moment a few years ago when looking at retiring early. I read everywhere about needing millions to retire. But if I can live and be happy on a very small monthly income, then I can achieve early retirement without the need for saving millions of dollars. By making sure I keep my expenses low and cut out big ones before I retire - like a mortgage - I need to earn/bring in a heck of a lot less each month. I can only say that I agree with you. It is a lot easier and efficient to cut spendings than it is to increase income. And here in Canada we have progressive (I should say agressive) income taxes. I'm currently in the 45% tax bracket on every extra dollar I make (and then we have to substract insurance, retirement plans etc...). So, as a rule of thumb, I must earn at least 2$ in before taxes income to get 1$ net. Still... I think that increasing income (pay per hour not hours spent at working) is a good idea anyway. I more than doubled my salary in 6 years by taking promotions. I still work 37,5 hours per week... Plus, my job is more motivating than it used to be. For sure I could lose it anytime and it might even happen very soon (the company I work for is restructuring). But these promotions helped me create a network inside and outside the company. My resume is a lot greater than it was 6 years ago and if I need to find another job I think it should be easier to earn above-average income.